Renovated in 2009 this luxury, 2 bedroom cottage is packed with charming period features (hand-made brick floors, old oak wall-panelling, exposed timber frame etc). Inside is warm and inviting with tapestry style curtains in golds and rusts frame mullioned windows, the open plan downstairs comes with large comfy sofas, chunky oak worktops and underfloor heating. In the bedrooms, find wonky wooden beams and antique furniture, made cosy with white cotton sheets and splashes of deep reds and oranges in the rugs and throws. And then there's the view. Gaze out across the meadows teeming with flora and fauna to the River Brett meandering through the grounds. You can borrow a boat, go fishing or explore the nearby medieval villages with their bounty of heritage sites. Yet Chelsworth is so pretty you'll hardly need to leave. Spend an evening under the stars with 2 private patios, a BBQ and deck chairs for that very reason. Look at our website www/oldpottery/co/uk for more information. I have loved living, working and bringing up my children in this beautiful part of Suffolk for the past 20 years or so. The cottage occupies a truely unique position next to the church in the middle of this quiet village. It's wonderfully peaceful and tranquil. Modern, rural living in a beautiful, historic building surrounded by water meadows, woodland and exceptional wildlife. Luxury panelled bathroom with large bath, big powerful shower, basin, heated towel-rail, wc, heated brick floor. Open-plan large living room with dining area. 2 luxury sofas (1 leather), coffee table, 32" Panasonic widescreen LCD TV, DVD player. Views onto paved terrace outside and French window to outside. Brand new luxury painted wood fitted kitchen with solid oak worktops. With oven, electric hob, dishwasher, fridge, washing machine, microwave, toaster, kettle, ceramic drainer sink etc. Exposed old oak beams. 17th century windows onto terrace. Outside: Two walled patio areas with herb and flower beds, large bay tree, large terracotta pots/Alpine tubs. 2 large garden benches, 2 folding deck chairs, glass topped patio table with 4 wood/metal chairs. Barbecue, storage shed. Views over field next door and the church. Very attractive and private. Cleaning / Towels / Linen / Maid service: Linen and towels included, changed every week. Property cleaned every week. We had a wonderful half term break, and all switched off and relaxed. Thank you and delighted to be able to share our lovely corner of Suffolk with you. Looking forward to welcoming you again. We’ve just enjoyed a wonderfully relaxing break at this gorgeous cottage with a pretty terraced garden. Comfy sofas and beds, crisp sheets, fluffy towels and the best shower ever! Lots of interesting walks nearby and a good village pub. 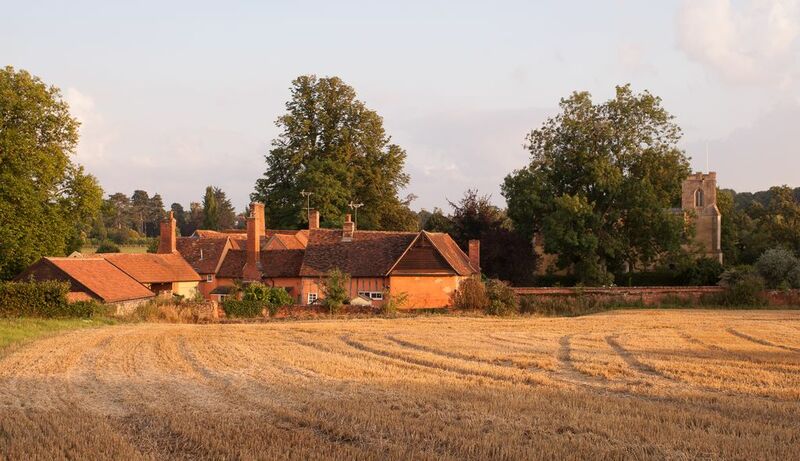 The lovely villages of Lavenham and Kersey are only a few miles away. The delicious welcome pack was a nice touch and our host most welcoming. We look forward to returning. Thank you. I remembered how beautiful and hilly the Suffolk and Essex borders were when I cycled them as a student thirty years ago so wanted to return to explore them again and do some birdwatching as the Autumn migration began. The week was a complete success. The Old Pottery is a picturesque, historic, and comfortable cottage with an attractive private external space to enjoy. The cottage is very clean, contains the best dishwasher we have ever encountered and has a very well designed bathroom and fast broadband internet. Yet it is full of beautiful character features reminding you of Suffolk’s history. The owner, Sarah, is very welcoming and generous as is her wonderful cat Marmite. We can vouch for the accuracy of all the reviews posted below this one and the photos of the cottage. We found many of the birds we were looking for at Lakenheath Fen and at The Naze at Walton in Essex. We also found, whist exploring the exquisite towns of Lavenham, Long Melford and Bury, that Suffolk has a very high standard food culture and were amazed by the choice of home made gluten free cakes available in the tea rooms. We were so comfortable in this quiet cottage and so struck by the beauty of the area (we didn’t even find time to explore Dedham Vale, Sutton Hoo, the large number of river estuaries or visit Minsmere on this occasion!) that I will be very surprised and disappointed if we don’t return to the Old Pottery soon. Full of character but very homely, friendly owner, everything you need for a great visit . This is a superb luxury cottage, part of a beautiful old home in the heart of a lovely Suffolk village. Friendly welcoming owner who gave us lots of information about the area. We had the best holiday we have had for years! It was a pleasure to have you to stay, thank you. Suffolk is such a wonderful county to explore, full of pretty villages, interesting towns, fascinating buildings and beautiful countryside. It’s always sunny too! We enjoyed our 7 night stay. The owners provided a lovely welcome and were extremely helpful with information about the property and the local area. We were provided with a welcome pack including a range of produce, very useful for the start of our stay. The setting is both picturesque and tranquil. We were out every day but made full use of the cooking facilities in the morning and evening. We both slept very well in a very comfortable bed in the main bedroom. It has been a lovely break. We've just spent a fantastic 3 nights at The Old Pottery. The location is stunning - surrounded by wonderful countryside with lovely walks and great pubs. The walks that we chose weren't too taxing but the views were gorgeous and we saw enormous hares, plenty of pheasants and a deer. The Old Pottery itself is beautifully furnished and had everything that we needed. Sarah was a fantastic host making us feel extremely welcome. The welcome treats (including eggs from her chickens) and flowers were a lovely touch. Our 8-year old son really enjoyed playing with Marmite, the friendly cat, stroking the horses in the field next door and watching the chickens roaming free. Thank you, Spring is such a great time to visit this lovely part of the country, there's so much to do. See you soon. The property is part of a beautiful, historic, 15th century, Grade 2* listed merchants house set in several acres of protected river meadowland. An ancient church nestles within the grounds. Peaceful and tranquil. A unique place to stay. The unspoiled village of Chelsworth is one of the prettiest in Suffolk with lovely thatched, painted cottages and the meandering River Brett teeming with wildlife. Enjoy fishing or take the boat for a paddle. Look out for kingfishers, otters & watervoles. Our local pub, The Peacock, is 50 yards away. You can enjoy local ales and good food in front of a warm log fire or in the pretty walled garden. There are plenty of good restaurants in the area which we can happily recommend. The unspoiled medieval wool village of Lavenham is just 5 minutes drive away. Timber framed buildings line the streets and market place. Enjoy visiting the magnificent church, galleries, shops and wonky tea houses. Other lovely historic nearby market towns and villages include Long Melford, Hadleigh and Kersey. We provide you with a delicious welcome pack of local produce including tea, coffee, milk, butter, eggs, bread and orange juice. We also have a travel cot and high chair for guests to use. You are welcome to use our family bicycles to explore country lanes. 20 miles approx from coast. Southwold, Aldeburgh, Woodbridge all in easy reach (about 45 mins). Stansted Airport (STN) 40 mins. Norwich Airport 90 mins. Cambridge 45 mins by car. London 45 mins by train from Colchester. 4 miles from Lavenham, 5 miles from Hadleigh, 15 miles from Ipswich, 17 miles from Bury St Edmunds and Colchester.